Plant/Fruit: Old Man Saltbush is a familiar sight over large areas of the dry inland of Australia. It is a grey-blue bush, up to 3 metres high and can spread to 5 metres. It is a long living plant, growing strongly after periods of summer rain, producing long tassels of flowering seed heads. 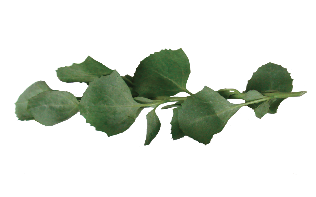 Taste: A salt flavour burst Usage: The large fresh or blanched Saltbush leaves can be used as a wrap around meat or fish, in salads or as a leafy bed for grilled meat or vegetables. The dried Saltbush flakes are a won¬derful addition to bread, grills, pasta and as a pot herb. Plant/Fruit: The Finger Lime Citrus australasica is a thorny sprawling rainforest understorey tree that grows in sub tropical Rainforest in Australia. Its fruit are truly delightful being the size and shape of fingers, but containing flesh in individual vesicles like caviar. 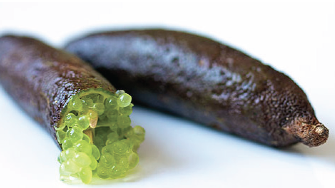 Finger lime is thought to have the widest range of colour variation within any Citrus species (green, yellow, orange, red, purple, black and brown). History: The Finger Lime is native to Australia and has been used as a food source for many thousands of generations by the Australian Aboriginal people. Unfortunately much of this rare fruit was destroyed by European settlers, while clearing space for farming. The commercial use of Lime finger fruit started in the mid-1990s in boutique marmalades made from wild harvested fruit. By 2000 the Lime finger was being sold in restaurants. Taste: A strong and very aromatic lime flavour, somewhere between a Tahitian and Kaffir lime, explodes in you mouth from the lime crystals. Taste: Black garlic is sweet meets savory, a perfect mix of molasses-like richness and tangy garlic undertones. It has a tender, almost jelly-like texture with a melt-in-your-mouth consistency similar to a soft dried fruit. 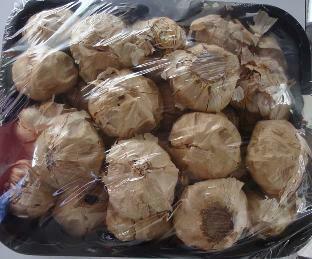 History: Black garlic is not a garlic variety, it is garlic in an aged state - fermented Garlic. Black garlic is a product created by the Japanese about 15 years ago. Origin: Our black garlic comes from the picturesque mountains of Yunnan. At an elevation of 3000 m, the town of Shangri-La makes an ideal location of Black Garlic aging facility. The factory staff is composed of local Tibetan villagers, bringing new job opportunities to a mainly farming based community. Process: Organically grown garlic from the valley of Jin Ja Xian is used. The high altitude assists in the aging process due to lower boiling point (caused by the atmospheric pressure of the region). Glacial and snow runoff provide a clean and mineral rich source of water for processing of Black Garlic. White cauliflower is the most common colour of cauliflower. Orange cauliflower contains 25 times the level of vitamin A of white varieties. This trait came from a natural mutant found in a cauliflower field in Canada. Cultivars include 'Cheddar' and 'Orange Bouquet'. Green cauliflower is sometimes called broccoflower. It is available both with the normal curd shape and a variant spiky curd called Romanesco broccoli. Both types have been commercially available in the U.S. and Europe since the early 1990s. Green-curded varieties include 'Alverda', 'Green Goddess' and 'Vorda'. Romanesco varieties include 'Minaret' and 'Veronica'. 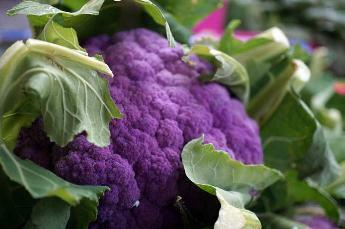 Purple Coliflower Purple color in cauliflower is caused by the presence of the antioxidant group anthocyanins, which can also be found in red cabbage and red wine. Varieties include 'Graffiti' and 'Purple Cape'. In Great Britain and southern Italy, a broccoli with tiny flower buds is sold as a vegetable under the name "purple cauliflower". It is not the same as standard cauliflower with a purple curd. After falling out of favor for many years, cooking and garnishing with flowers is back in vogue once again. Flower cookery has been traced back to Roman times, and to the Chinese, Middle Eastern, and Indian cultures. 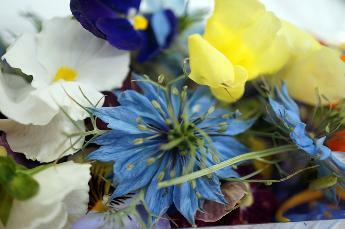 Edible flowers were especially popular in the Victorian era during Queen Victoria's reign. Today, many restaurant chefs and innovative home cooks garnish their entrees with flower blossoms for a touch of elegance. The secret to success when using edible flowers is to keep the dish simple, do not add to many other flavors that will over power the delicate taste of the flower. Today this nearly lost art is enjoying a revival.